R.D. 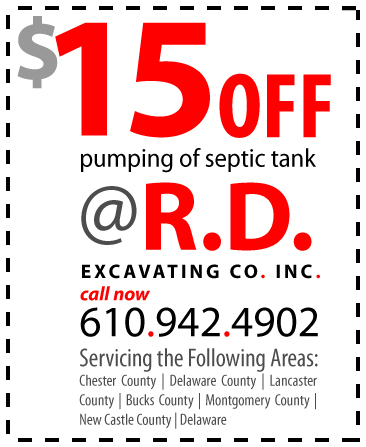 Excavating is a full service septic company. We offer 24 hour emergency septic service, septic pumping, perc testing, septic system design, repair, and installation. We also provide septic inspection and certifications, hydraulic load tests and video pipe camera inspection. Our team members are trained and experienced, in all phases of septic services. In addition to our septic services we also offer residential and commercial excavation services. R.D. Excavating looks forward to helping you! R.D. Excavating is a full service septic company. We offer 24 hour emergency septic service , septic pumping, perc testing, septic system design, repair, and installation. We also provide septic inspection and certifications, hydraulic load tests and video pipe camera inspection. Our team members are trained and experienced, in all phases of septic services around the area. In addition to our septic services, we also offer residential and commercial excavation services . Our area of assistance covers anything from single home excavation, to housing developments and corporate properties. R.D. Excavating Co. Inc. holds the tools and experience level necessary to provide nothing but the best excavation services possible. Our excavation services are incredibly efficient, keeping in mind the customers concerns about the time duration and the effect on the land. We strive to complete our excavation service as fast as possible, while also making sure that all or our services, including septic, are done right the first time. R.D. Excavating Co. Inc. is the area’s top pick to assist all of your septic pumping and excavation service needs. We look forward to helping you!